She is as delicate as the roses, sun-kissed, regal, and passionate, and now you can send her the bouquet that embodies her spirit. 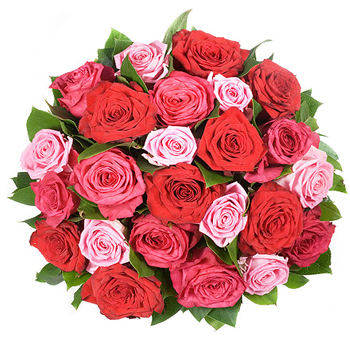 Two dozen Roses in shades of pink are complemented by lush greenery and speak the emotions that your words cannot. Send Passion Burst to the one you love on Valentine's Day, your anniversary, her birthday, or any romantic occasion when you want to let her know what's in your heart.